SpaceX on Thursday launched two experimental satellites. The satellites are designed to test Starlink, a concept to bathe all of Earth in high-speed broadband internet using a fleet of 12,000 satellites. Elon Musk, the founder of SpaceX, posted a video of the new satellites deploying into orbit. The first pieces of a radical plan to bathe Earth with high-speed internet access just launched into space. SpaceX, the rocket company founded by Elon Musk, piggybacked two experimental spacecraft onto a rocket that deployed a Spanish radar satellite into orbit. Officially known as Microsat-2a and Microsat-2b, the spacecraft will test technologies that would enable the creation of a pervasive broadband network with connection speeds roughly 180 times the global average. The scale of plans for the space-based network, known as Starlink, boggles the mind. In the coming years, SpaceX may launch 4,425 Starlink satellites into orbit some 700 to 800 miles above Earth, plus another 7,500 similar spacecraft into lower orbits. That’s nearly 12,000 satellites – more than twice the number of all satellites launched in history, according to a count by the Union of Concerned Scientists. If the project is successful, people around the world would get internet that’s about 40 times as fast as current satellite internet providers, even in very remote and rural areas. SpaceX and Musk released the first-ever public images and video of the satellites shortly after their launch on Thursday. SpaceX/YouTubeA camera on the second stage of a Falcon 9 rocket shows Earth, the freshly deployed Paz satellite, and two experimental SpaceX satellites, called Microsat-2a and Microsat-2b. The Spanish satellite, called Paz, deployed about 11 minutes after the Falcon 9 rocket launched, followed by Microsat-2a and Microsat-2b some time after that. 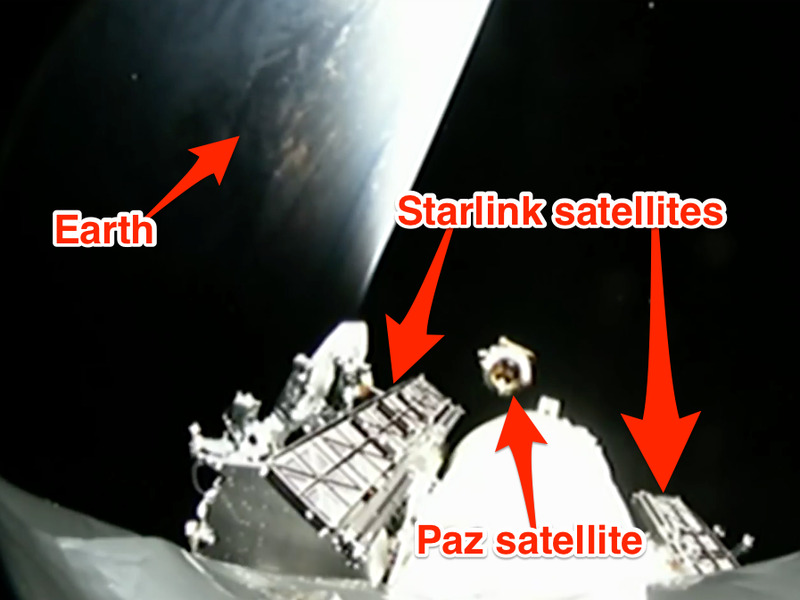 A live webcast of the Paz mission launch on YouTube offered the first-ever (though somewhat fuzzy) glimpses of the two Starlink satellites (above). An announcer said during SpaceX’s live webcast that the company couldn’t show the deployment of the Starlink demonstration satellites because of poor signal coverage. However, the rocket later beamed down high-resolution video of the satellites deploying. “First two Starlink demo satellites, called Tintin A & B, deployed and communicating to Earth stations,” Musk tweeted with a clip of them floating out into space. Musk later said the two satellites “will attempt to beam ‘hello world'” on Friday when they pass over Los Angeles – a critical moment that would show the spacecraft can talk to ground stations. “Don’t tell anyone, but the wifi password is ‘martians,'” Musk joked. The list of Starlink test-ground stations, according to Federal Communications Commission documentation released earlier this month, includes the offices of Musk’s electric-car company, Tesla, which sells internet-connected vehicles. In November, the FCC gave SpaceX permission to launch the two spacecraft and test its space-based internet concept. 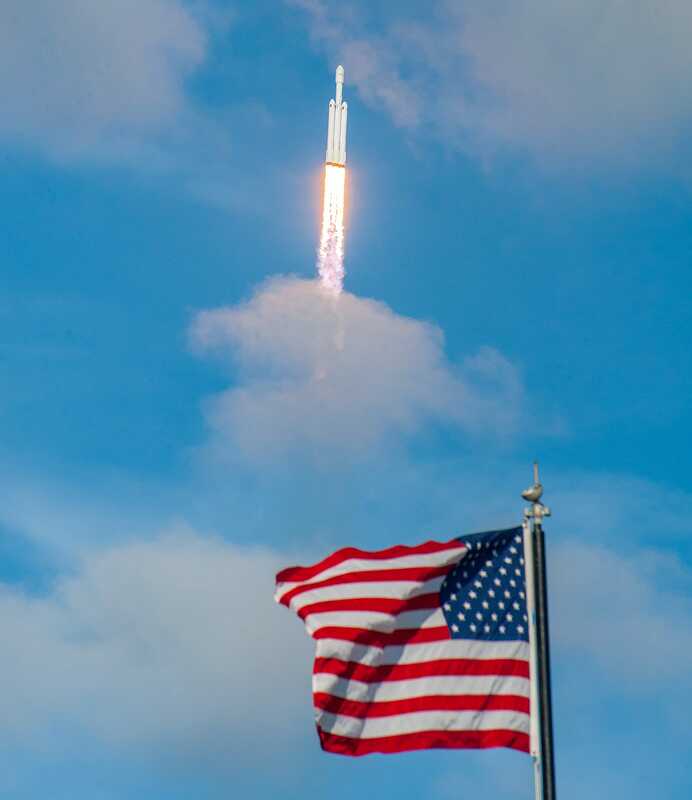 Dave Mosher/Business InsiderSpaceX’s Falcon Heavy rocket launches toward space for the first time on February 6, 2018. Musk and SpaceX have said little about their plan since announcing it in 2015, but the full, nearly 12,000-satellite fleet ultimately needs approval from the FCC, which regulates internet access. It may seem like an absurd task to launch thousands of satellites, but SpaceX regularly deploys 10 at a time with its reusable Falcon 9 rocket system. The company has also successfully test-launched its Falcon Heavy system, an even larger reusable rocket that can send twice as much payload into low-Earth orbit as the next-largest launcher on the market – at perhaps one-fourth the cost. So it’s feasible that Falcon Heavy could deploy dozens of Starlink satellites in a single launch. Musk hopes to get Starlink in an operational (though not complete) state sometime around 2024, according to Florida Today, and start selling access around that time. Musk and SpaceX have not yet said what the monthly cost of the service might be. But Musk said in 2015 that user terminals should be laptop-size and cost between $US100 and $US300 each. Read more about SpaceX’s plan to create Starlink.